Netflix recently released yet another original series, a cartoon called BoJack Horseman. Netflix has done a pretty good job of producing original content. I'm not sure if the business model works out--I don't know if having new exclusive shows like this is gaining or retaining many new subscribers after a certain point--but as consumers we certainly can't complain. While I haven't watched all of their material, I've watched most of it, and with the exception of Hemlock Grove they've all been high quality. Anyway, BoJack Horseman is a series about a washed-up former sitcom star (who also happens to be a horse) and how he handles that life. 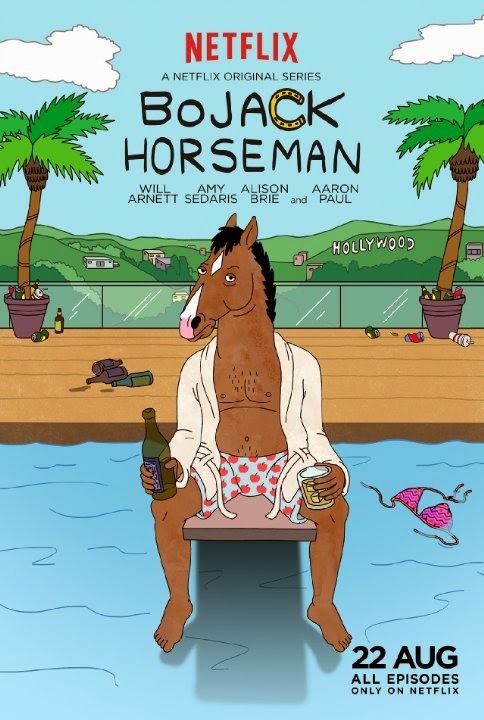 BoJack was the lead in Horsin' Around, a clear parody of Full House, and has gotten immensely rich from it. (Unlike other stories of former celebrities, he appears to be managing his money well; we see him spend lots of it wastefully with little consequence.) The driving force behind the 12-episode arc is BoJack's memoirs--in order to get him back into the spotlight, he agrees to have a ghostwriter work with him to talk about his past. It's a clever framing device that not only lets us legitimately delve into his past, but also to contrast it with his current life. And his current life is a mess. The main cast, besides Bojack, involves his roommate Todd, a complete burnout who just sort of hangs around; Princess Caroline, a cat who acts as his agent and occasional girlfriend; Mr. Peanutbutter, a golden retriever who, as another former sitcom star, is a friendly rival to BoJack; and finally Diane, BoJack's ghostwriter. There's also plenty of recurring characters as well, including Sarah Lynn, the now-grown-up co-star of Horsin' Around, and poor Pinky Penguin, the contact at the brink-of-failing book publisher. I suppose I should point out, if it hasn't been obvious yet, that the world of BoJack Horseman is...well, different. Half of the characters are human, while half of them are anthropomorphic animals of some sort (retaining some sort of human elements). As you can see in the picture above, BoJack is clearly a horse, although he had hands and feet like a human. The same goes for a lot of other characters, both main, secondary, and background. While the show is clearly a comedy, it deals with some startlingly heavy topics, such as depression. Everyone's life in the rich and fabulous world of Hollywoo is empty and angry. * While this certainly isn't a new insight into the world of celebrities, it does manage to handle it uniquely and with a surprising amount of sensitivity. This isn't Simpsons or Family Guy, full of non-sequiturs and cutaway gags, and there's little by way of shock humor. It plays out probably more like King of the Hill, where dialogue and character development are emphasized more than having a gag a minute. It also has a lot of the "callback" structure of other shows (notably Arrested Development)--there's rarely a reference that doesn't get brought back, to good effect, in a later episode. The premise seems, well, different enough, but does it hold it together? For the most part, it does, but it's not perfect. First off, let's look at what is good about it. *The show manages to balance the writing, the subject matter, and the voice talent pretty well. It's refreshing that the show isn't just about getting away with as much profanity as possible and it's just a series of absurd quick cuts to a bunch of unrelated topics. While obviously it's a show about talking animals, it sometimes feels more real than, say, Family Guy or South Park. That's a little weird, and to its credit. *While the whole "anthropomorphic animal" gimmick would seem like it would get old or be used as a crutch, the writers manage to get a lot of mileage out of it. Some of them are just throwaway visual gags (a beaver cutting wood like a circular saw with his teeth; Princess Caroline using a scratching post as part of her "workout"); some are a lot more subtle and clever. It takes an episode or two to realize that Mr. Peanutbutter isn't just a nice guy, he's kind of dim, likes everybody, and has a low attention span...just like a golden retriever. ** When someone is about to get arrested by the cops, one of the cops is an electric eel--and you suddenly realize that someone's about to get tased. Neal McBeal is a seal, and it turns out he's in the armed forces as a (wait for it)--Navy SEAL. These all seem obvious, but when you watch (especially the background and secondary characters) you realize how much thought was put into each one. *Some of the writing is just damn clever. A lot of it is well-crafted dialogue, but some of it is just some old-fashioned sketch humor that manages to pull it off. The scene with Dr. Hu and the confusion while shooting the movie (BoJack plays Mr. Peanutbutter and Wallace Shawn plays BoJack and...well, just watch it) are highlights. And even though it's just a stupid joke, I loved it any time Vincent Adultman showed up. *A point should be made about the voice casting: it's fantastic. You already have Will Arnett as BoJack, who manages to convey the lonely despair with a heaping dose of feigned (and quite real) arrogance. But you also have Aaron Paul (from Breaking Bad) basically playing the same sort of character in Todd; Princess Caroline is voiced by the great Amy Sedaris (Strangers With Candy and various rabbit-related things); Alison Brie (Community and Mad Men) is cast as Diane; and Paul F. Tomkins (every cartoon ever) does Mr. Peanutbutter. Patton Oswalt, Maria Bamford, J.K. Simmons, and Kristen Shaal also have fairly large parts, and there's also a few cameos from celebrities. *The show can seem uneven at times. Even though above I said it was balanced, there's quite a few episodes where it's not. For example, the character of Charlotte (a romantic what-if scenario with BoJack) seems interesting, but it doesn't really go anywhere, and it's not particularly dramatic and the laughs come to a screeching halt when she shows up. Other times, the writing simply goes from amusing and whimsical to show-stoppingly awkward, and not in a good way. *Some of the plot points don't seem to go anywhere, even though it seems clear that they should. Mr. Peanutbutter and Todd's creative adventures together seem like it's going to build up to something, but it really never gets resolved by the end of the series. The character of Wayne looked like it was going to cause some sexual tension with Diane, but it kind of just fizzled out into nothing. *Speaking of, the character of Diane just seems to be...flat. And it's strange, because the writers go out of their way several times to delve into her background and her personal issues, but it's not written well enough for anyone to care. Her role seemed to matter so little that her biggest impact was creating tension between Bojack and Mr. Peanutbutter. Even when (spoiler alert, I suppose) BoJack looks to her for validation towards the end of the series, one has to wonder why any of us, or even BoJack, would care what she thought? So, in the end, is BoJack Horseman worth it? I say yes. It can take a little while to get into the swing of things. But the animal-as-human concept was executed surprisingly well, and for an animated series it's very refreshing. However, it does get heavy-handed at times, and I know a lot of people watch a few episodes and just can't get into it, which I can understand. Still, I think it's worth giving it a shot, and at twelve half-hour episodes there isn't much to lose. *No, that's not a typo.